The new thing had been rolags and punis on the podcasts I’d been listening to as of late. I was scrolling along and literally was stopped dead in my tracks, by these colors. Gorgeous, amazing, happy, bright, colors. Several colors that each blended perfectly to the next all rolled up in a nice neat rolag form. The colorway was called, Neon Sunset. 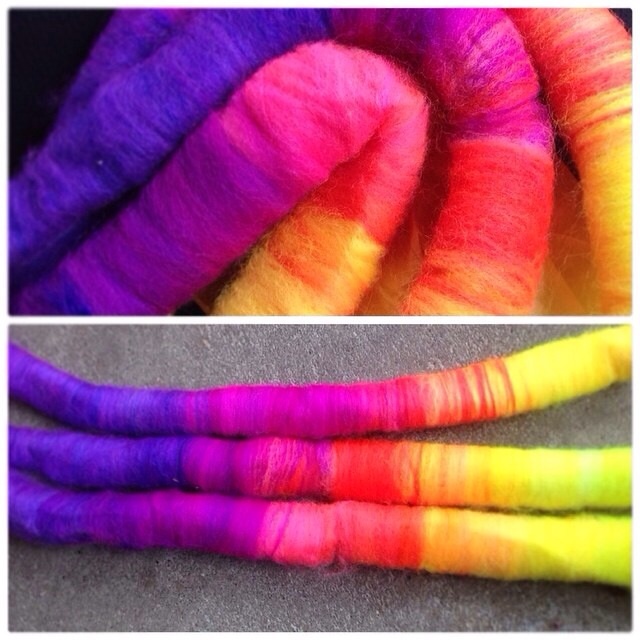 I had the choice two different silk blended wool fibers. I chose the polworth, as it’s my favorite. I had also bfl/silk to choose had I wanted, they were both awesome, but again, polworth has a puff factor I love. So I had to have the polworth/silk rolags. Immediately, if not sooner. Naturally, I ordered. The box came neatly wrapped in tissue paper, as initially I had plans, to split half and half. Holly, one of the two the proprietors of Blue Barn Fiber (the other being her husband, Dan), had separated them for me and wrapped each ounce already separated, as I initially planned to share half, lol. However, once in my possession, I couldn’t let it go. That’s right, I kept it all totally selfishly for myself. And guess what… I’m not sorry, lol. Shortly after that purchase, she decided to offer the same colorway, in choices of, mohair or teeswater locks. Once again, immediately, I ordered the teeswater locks. I couldn’t pass it up, it was a pair, the rolags and locks… They were meant to be together, it was fate. One should never tempt fate. Far be it for me, to tempt fate, I won’t do it. Let me tell you, I have a stash. A large stash. This went on the wheel next. Look at these colors, I had no other choice. 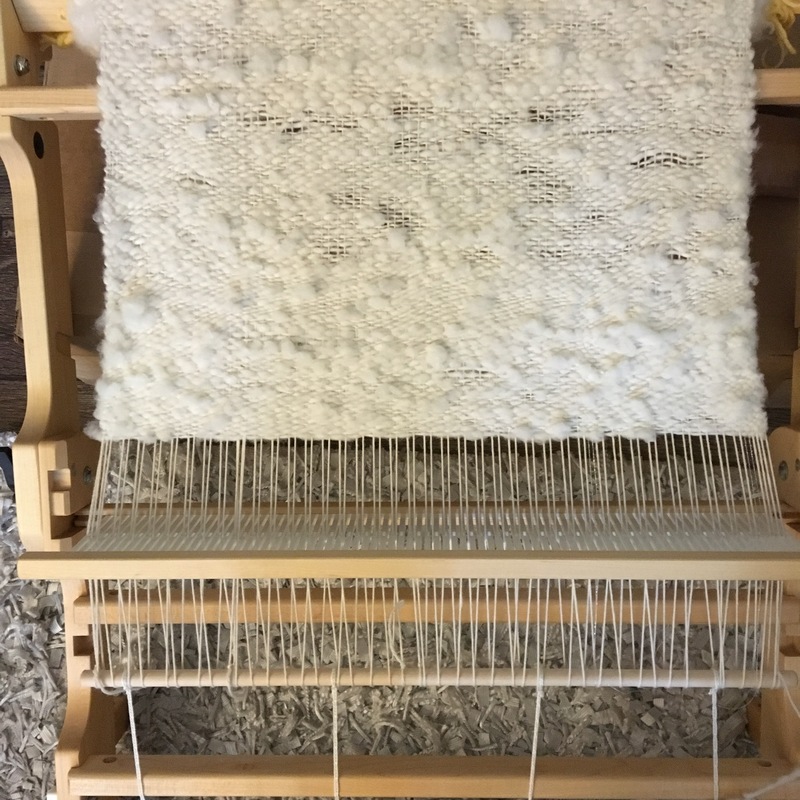 I had 6 rolags total, so I spun 3 colors going end to end very thin, with the plan to spin the other half the same thinness with the teeswater locks, in the matching color or as close to it locked in the twist. First bobbin of rolags, spun thin. Basically, as I spin, I split the single in two and put the lock inside at the middle of the lock, and continue spinning. It’s in there pretty good, but my hopes are the plying will lock it in that much better. I’m also spinning the other rolags end to end same as the first single, ideally, the colors will meet up and if I have some barber poling happen, that’s okay as it’ll lead into the next color. This is a double first for me as, I’ve never spun rolags before this. Rolags, at least, blue barn fibers rolags are smooth sailing, just dreamy to draft thick or thin spinning can be done easily, but I love yardage. So, thin it is. Second, I’ve never spun handspun like this, one normal ply, and the other ply with teeswater locks. Both very thin singles. I’m interested to see how this turns out. We will both be surprised. I’ve taken lots of photos along the way. This teeswater lock adding is very very time consuming. But I’m enjoying every second of it. I’m thrilled to see it turn out. I’m writing this as I spin, so the actual outcome is a total mystery to me at this point. On another note, while making my second order with Blue Barn Fiber, ordering the teeswater, I decided it was high time I see what sari silk is all about. Playing with it in batts, corespinning, you know, just really getting a feel for it. So I ordered that at this time, as well. I had written her some notes through etsy asking questions. Holly was so patient, thorough, and sweet. Excellent customer service. I mentioned how rolags were new to me, also the sari silk, stainless steel, qiviut, rose pearl fiber… You can imagine my Squeeee when I opened my box of teeswater locks in neon sunset and sari silk, to also find samples of the stainless steel, her BUTTERSILK™, camel down, and you won’t believe this, but, qiviut!!!! Yes, Holly, sent me qiviut. The most coveted, and one of the most expensive fibers around. I still can’t believe it. But before I go further on the qiviut, because qiviut has a reputation all it’s own. Let me tell you, the Buttersilk™ is freaking amazing. 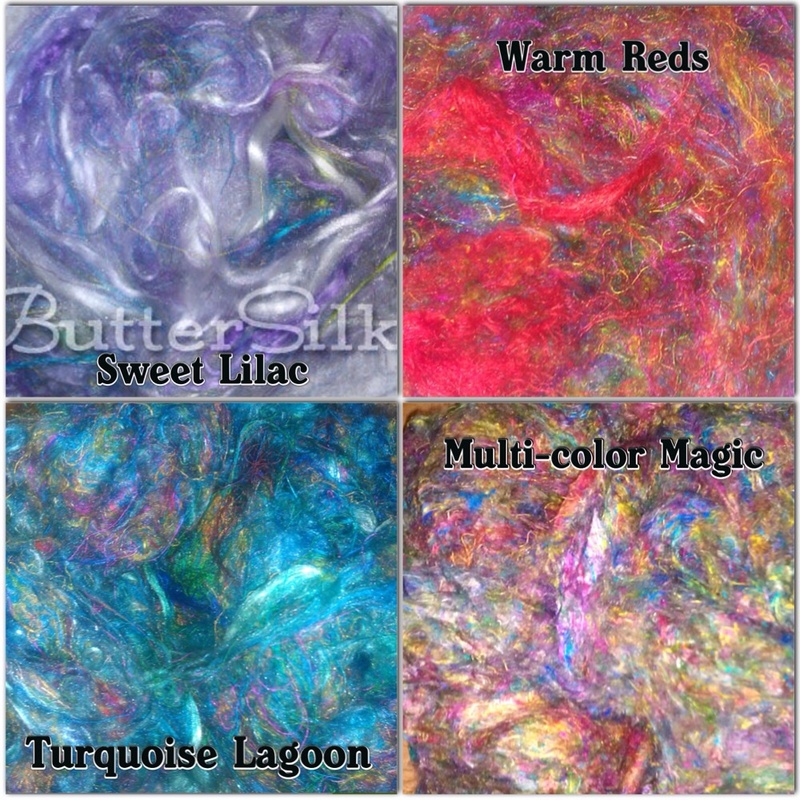 Honestly, I doubt I will ever buy sari silk again, because the Buttersilk™ just melts in your hands. 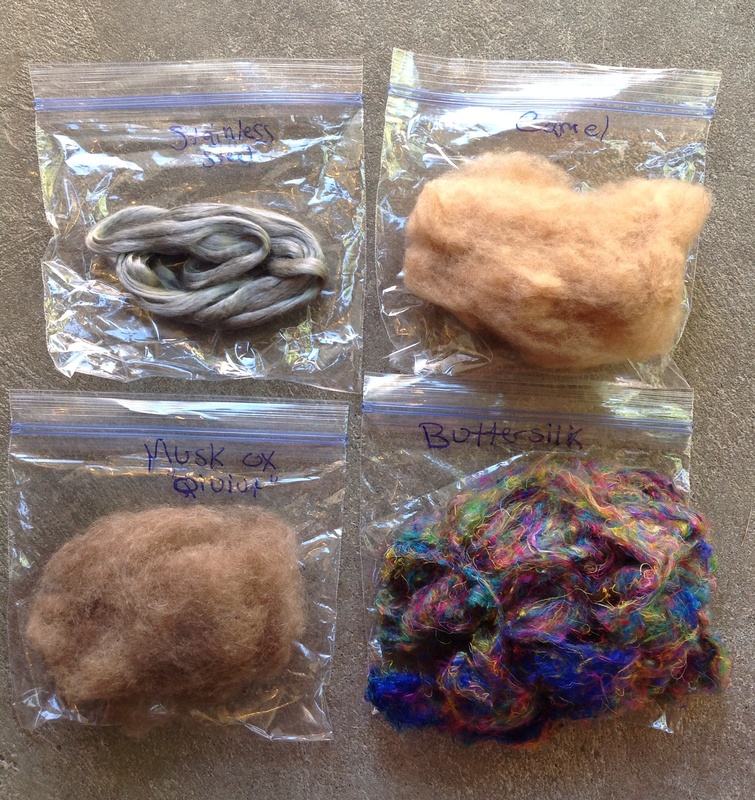 It’s hand pulled sari silk, mixed with mulberry silk, and more, more, more. It sparkles and it’s soft literally like butter in your hands. Like, chocolate that has sat in a hot car melts in your hands. 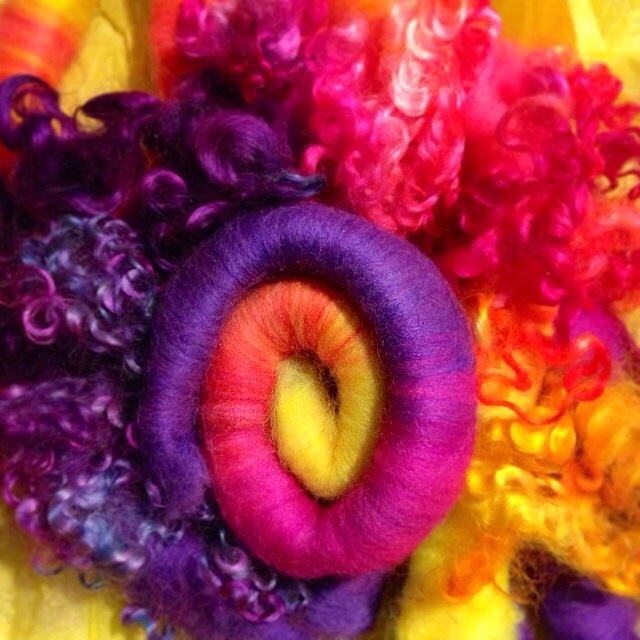 Soooooo silky soft with the sari silk factor. It’s amazing. A little goes a long way, it comes in multiple colors and the price can’t be beaten. It had been on sale, so I bought a few more colors, and as if that wasn’t enough, if you had a special color in mind I have no doubt, she would make it just for you, each customer is special. 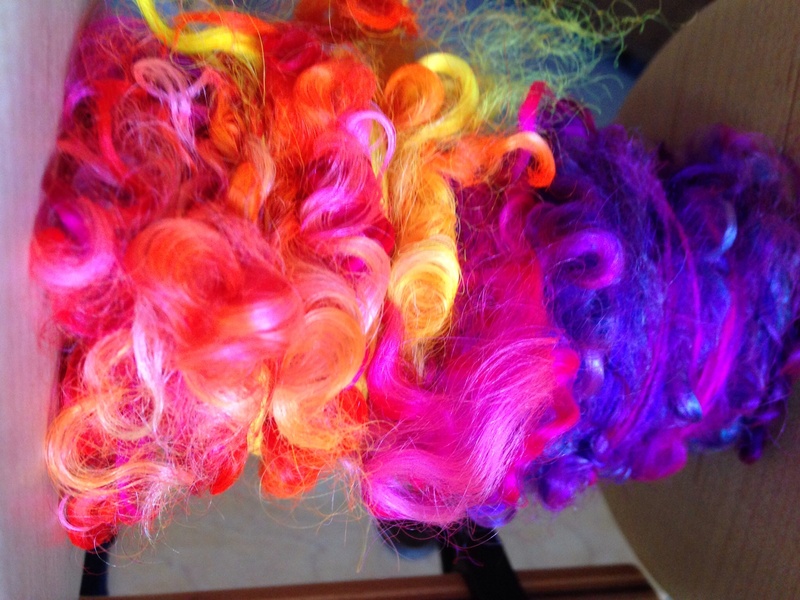 Her etsy shop is chock full of a fiber artists dream. 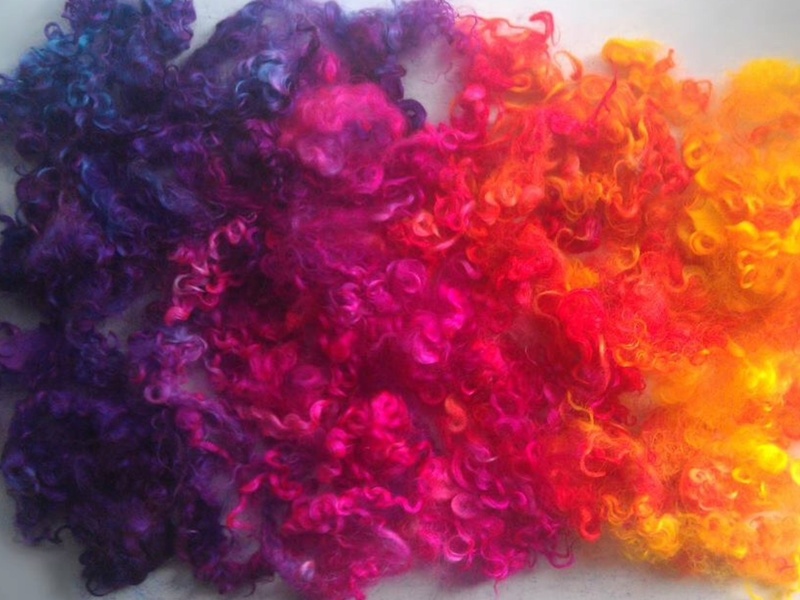 She sells in bulk too for cheaper pricing, for those wanting to make larger projects or I imagine for other fiber artists to use and sell in smaller quantities to make money…. This shop is for everyone. It’s obviously a favorite of mine, and others as well , as she sells out of items at times. No worries on that either, she restocks quickly, and a quick message to her about what your needs are and she makes it happen. The customer service, is perfect, I feel like a special VIP customer every single time I shop, from the first time, to several purchases later. 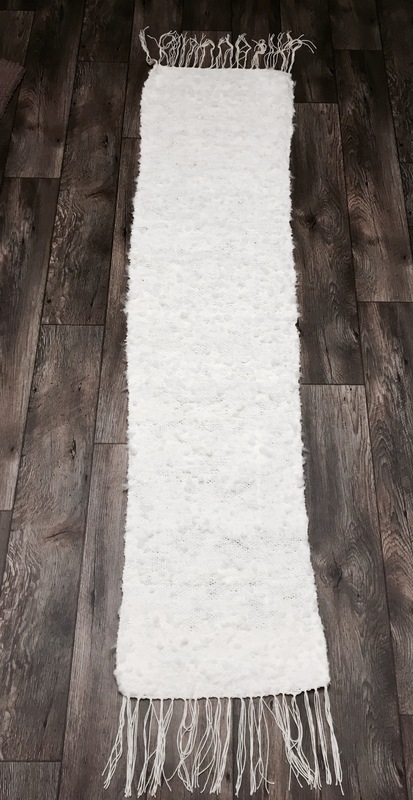 Blue Barn Fiber products, always impeccable. Nothing but the best quality fibers. Example, the dyed teeswater I bought was sourced from Namaste Farms. Namaste Farms has the best teeswater out there and let me tell you as her customer also, good fiber is not cheap. That is my point. She sources the best quality fibers available. The stainless steel, I can’t wait to make a little yarn skein for glove fingertips to be able to enjoy touch screens without the need to remove a glove. I understand a little of this fiber goes a loooong way. It’s definately a fiber that needs to be blended with something else. 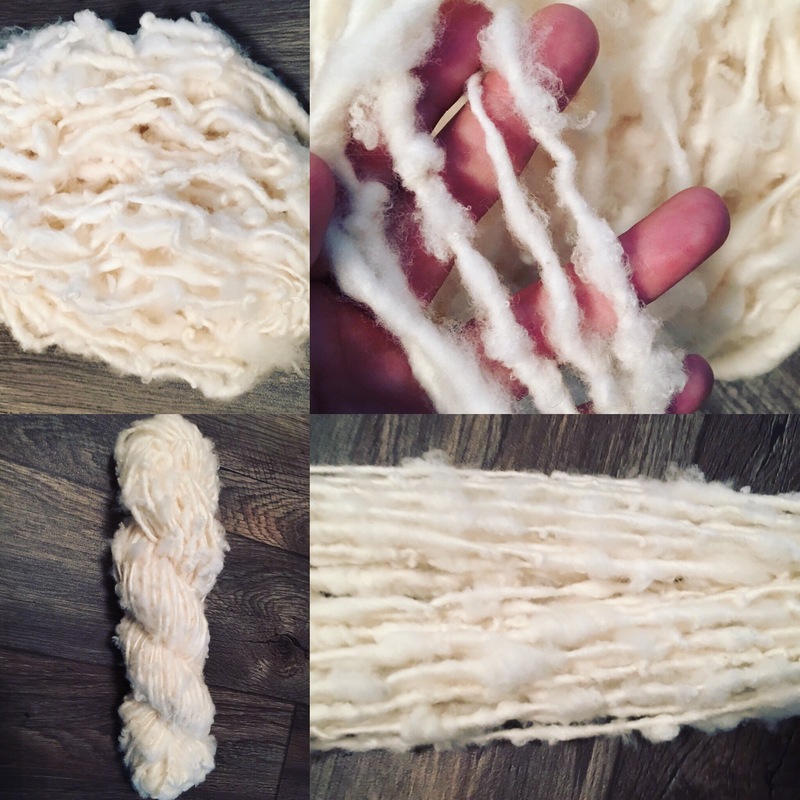 Another blog post when I use this fiber for sure!!! Touchscreen gloves for gifts are going to be total winners! I have an awesome idea for this, I will share before the holidays. 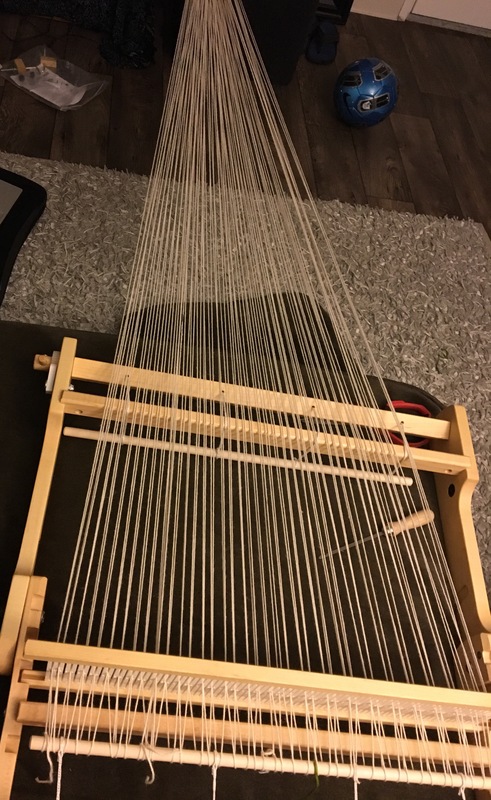 The qiviut will also get it’s own blog post when I experience that, however, I’ve never heard of bad qiviut, and this sample she surprised me with matches all the great things I’ve heard about this fiber. It’s so soft I almost can’t feel it. Although I saved this for last to touch it’s insane. 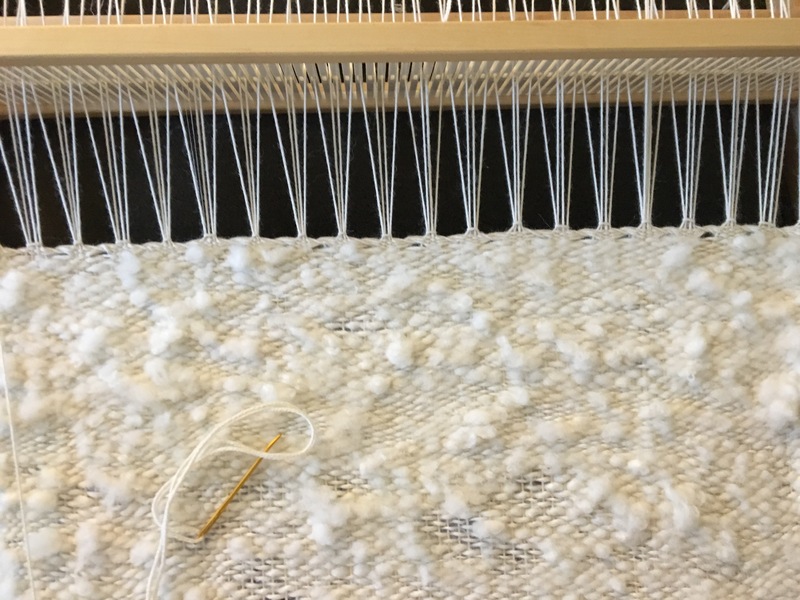 This is one of those precious fibers people tend to wait on using… Are you one of those? Clearly, I need more. See, that’s my thing, I can’t use what I have until I have more. 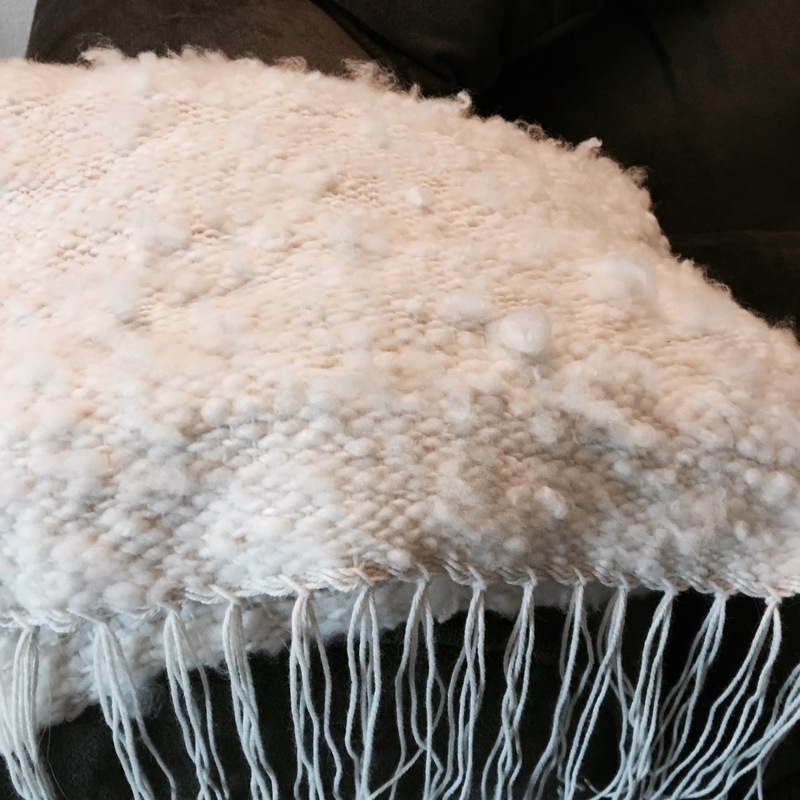 Soooo, a qiviut purchase from Blue Barn Fiber might need to happen prior to testing this. I can’t be left with none after using up the sample, sheesh. Just enough to spin a very fine 2 ply that I can make a cowl or I believe it’s called a smoke ring? You know, the cowl, that can go over the head? Also, do I blend? Or do I go full on quiviut? I’m thinkin full on quiviut… We only live once and it’s an heirloom piece. Right?! Mmmmmm qiviut. I feel like Homer Simpson talking about donuts or beer. 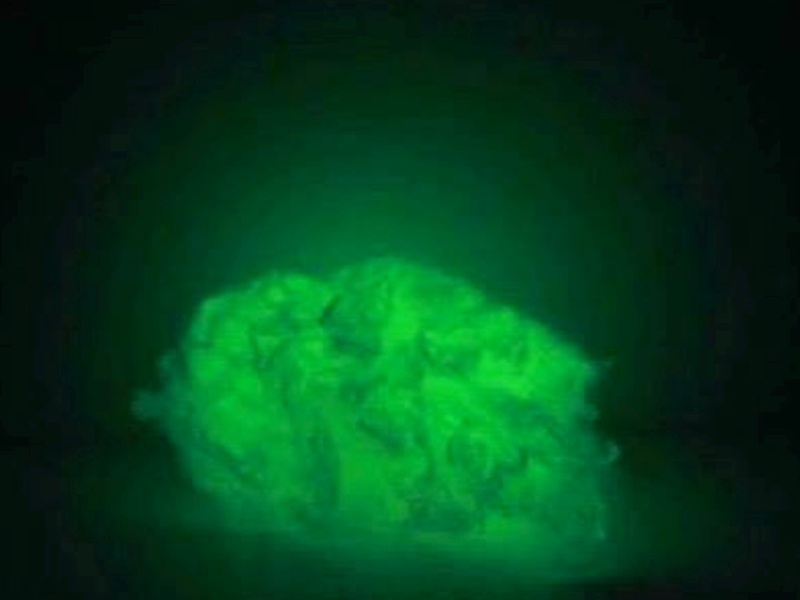 Now, they have glow in the dark fiber, it’s a nylon type fiber so while I haven’t tried it yet, that is just awesome!! Add it on the trim of a child’s hat and charge it up under some light before a walk at night, and safety increases. This fiber in a project, glowing away is going to be a conversation piece in any dark room. Anyone, who doesn’t think a handmade glow in the dark accessory isn’t awesome, really isn’t worth your time. Lol this is better bait than that schmatzch.com dating site, or whatever it’s called anyday. Also imagine for a baby blanket, little stitches, here and there, like stars, when the lights go out for bed. It glows in the dark of course it’s magic, everyone knows that. Especially kids, and grown ups, like myself. Last, but, certainly not least, a little more about the brains behind such a cool website/store, … Holly got her degree in Environmental Science and is very sensitive to keeping the earth healthy and green. Additionally, she works as a graphic designer but has the etsy shop with her husband ultimately planning to farm and fiber full time. We need our farmers, we’ve lost too many already. Blue Barn Fiber’s love of the earth, renewable resources, fiber, and animals is shown again and again. In saying that, they only purchase cruelty free fiber. Dan and Holly are awesome. Their website can lead you to everything and has pictures and links needed. You have to check out there website! They literally sell a zillion different items, lots of fiber in all kinds of breeds and animal plant and recyclable materials, tools, etc etc, if you are looking for something particular you don’t see, just message, and they will do whatever they can to obtain your wish…. Just like a fiber fairy who lives in a blue barn. GO NOW, you won’t be sorry and try the Buttersilk™ It’s love and heaven in fiber form. They are the epitome of everything fiber arts, you want to try. I love this shop period, love!!!! LOVE!!! 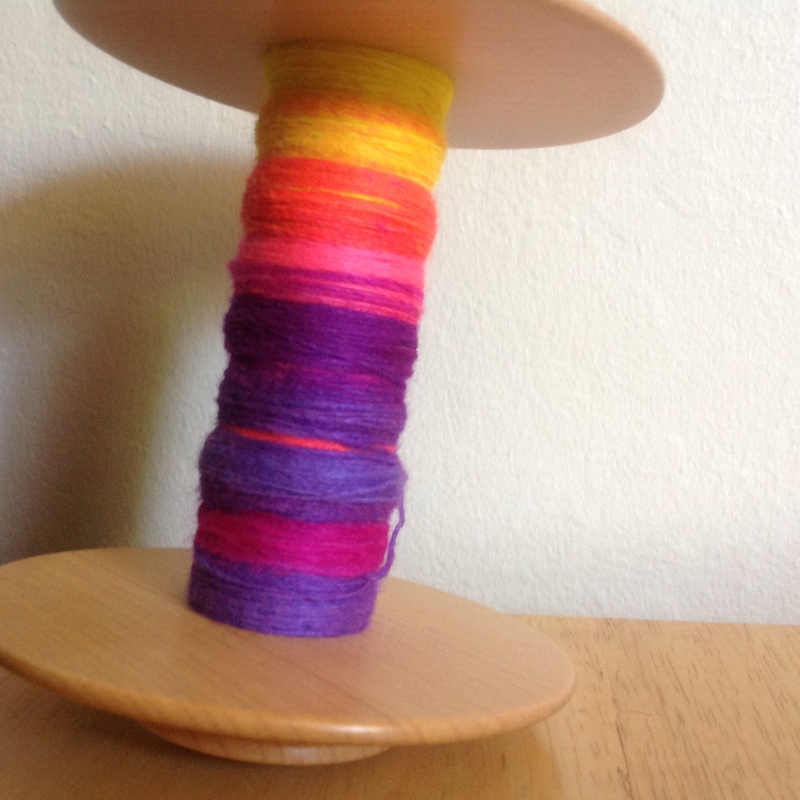 I’m currently plying my neon sunset and hope to have it pictured before the day is over. 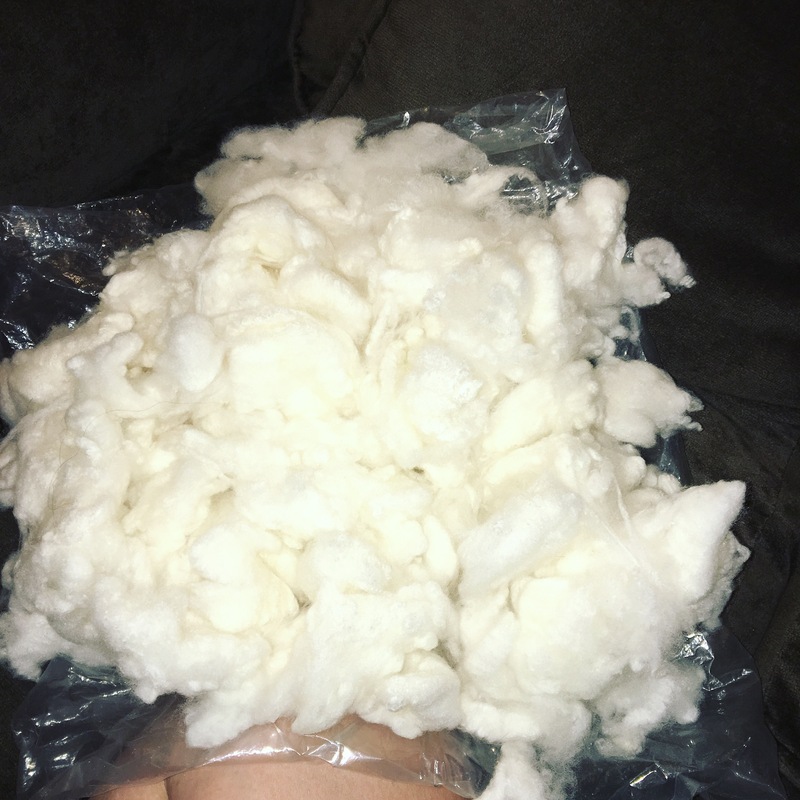 Go check that shop out, any questions, seriously amazing amazing place to find the newest fiber on the market, including inventing her own fiber blends that’s are to die for…. Literally, clouds of heaven are being sold in her shop. Well fiber friends, that has changed by leaps and bounds. 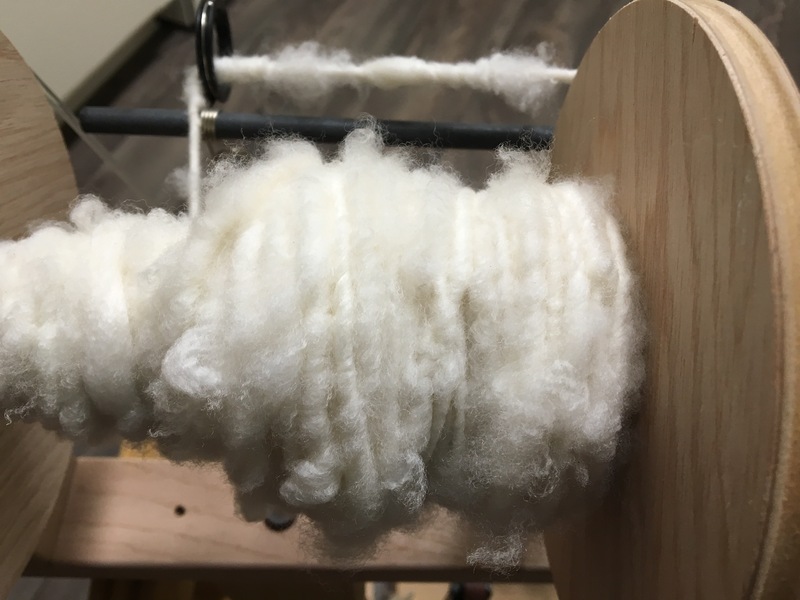 We have fibers to spin, made from everything from stainless steel, to glow in the dark fiber, to rose fiber (yes, fiber made of crushed rose stems, that has a pearl sheen, and a faint rose scent) oh, did I mention pearl? Because, yes, they also have fiber with ground pearl dust that is infused into the fiber. Are you kidding me?! 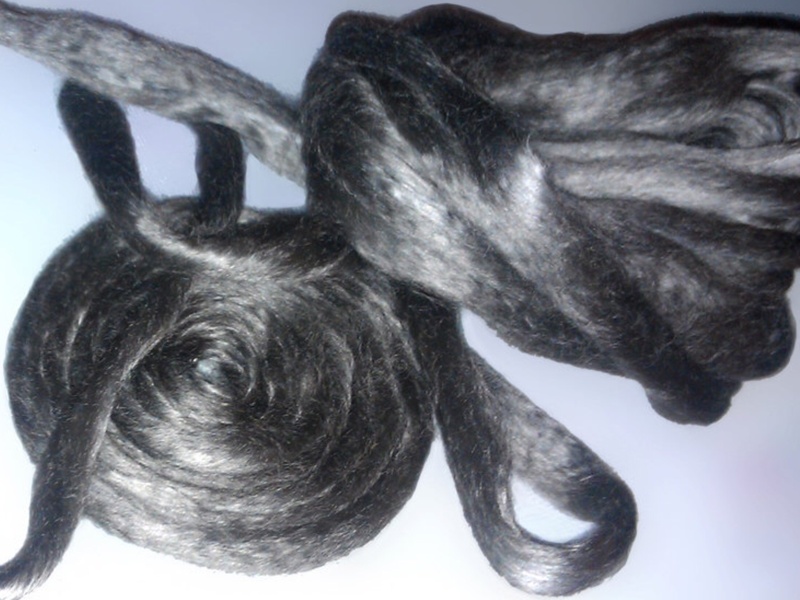 Stainless steel fiber to make your yarns work with touch screen! We have beautiful natural colors growing on animals that are new, and colors that are neon bright, due to brilliant hand dyed fiber artists who have amazing color sense. 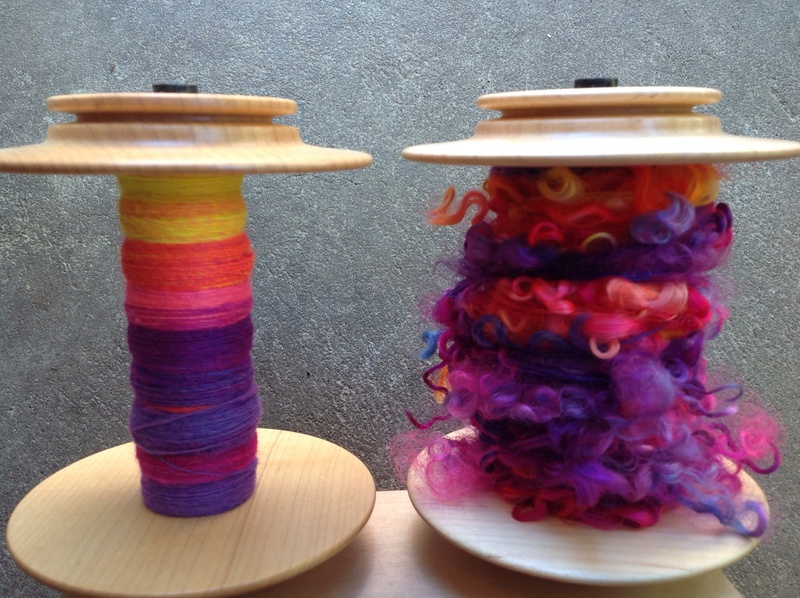 Now, fiber is grown by farmers with spinners in mind, no longer just a by product, as with several breeds, in the past. 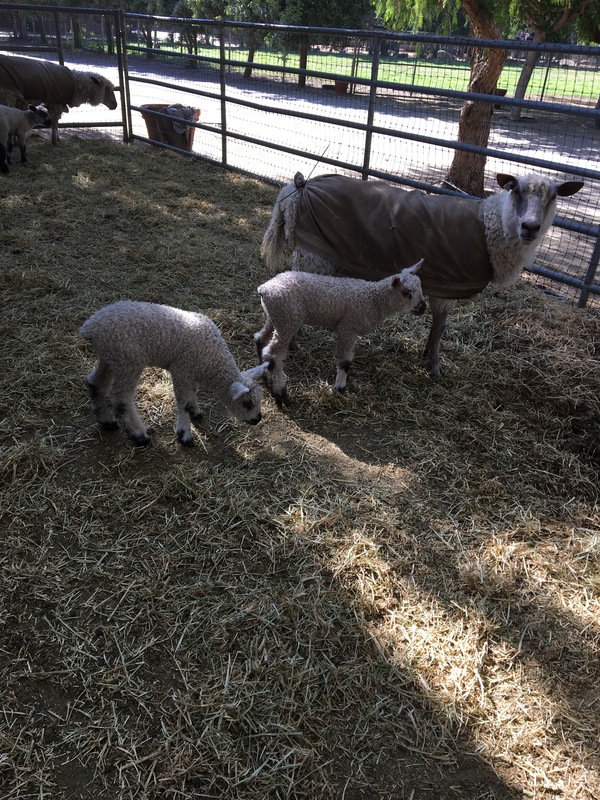 Sheep are coated to keep their fleece free of vegetable matter and sun damage. 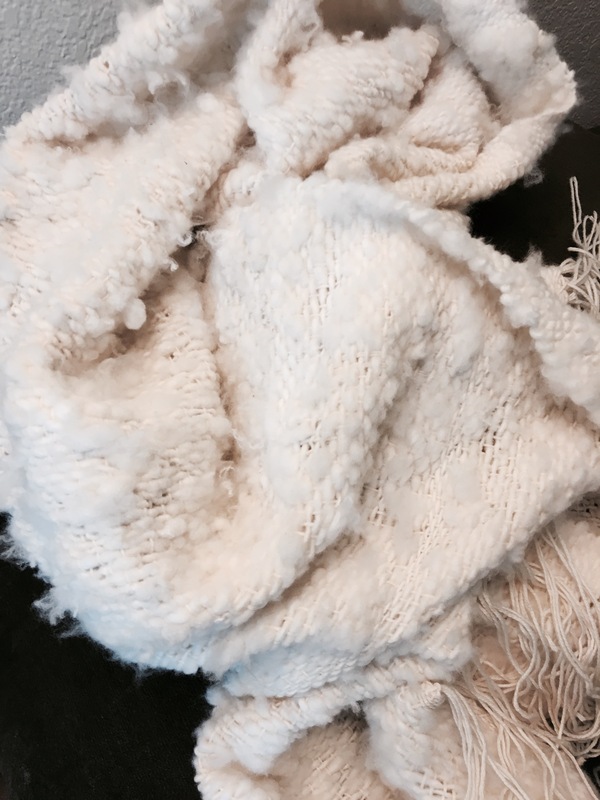 A very labor intensive process of changing the coat as the sheep and fleece grow. 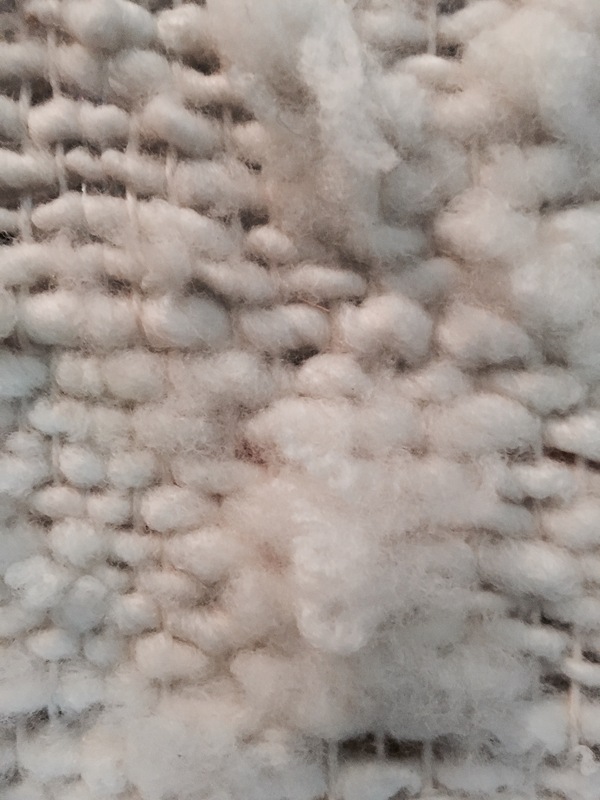 Shown in this photo is a coated Namaste Farms teeswater. Although we still have many fiber growing animals where the fleece is a by product, the word is spreading. 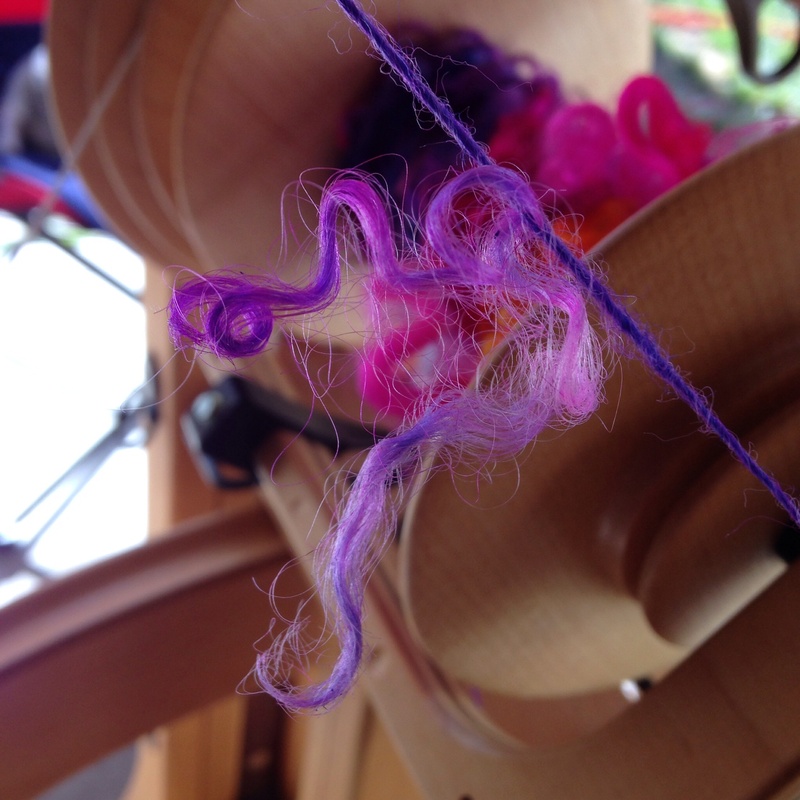 As spinners, we know all fiber has it’s place, it can all be used for something, somewhere. I am just in love with the new products that are coming out as time passes. We are so lucky, to be fiber lovers at this moment, and it’s only going to get better for our future people inclined to be of the fiber addicted persuasion. WE ARE SO LUCKY!! And I plan to show such fiber in future posts! 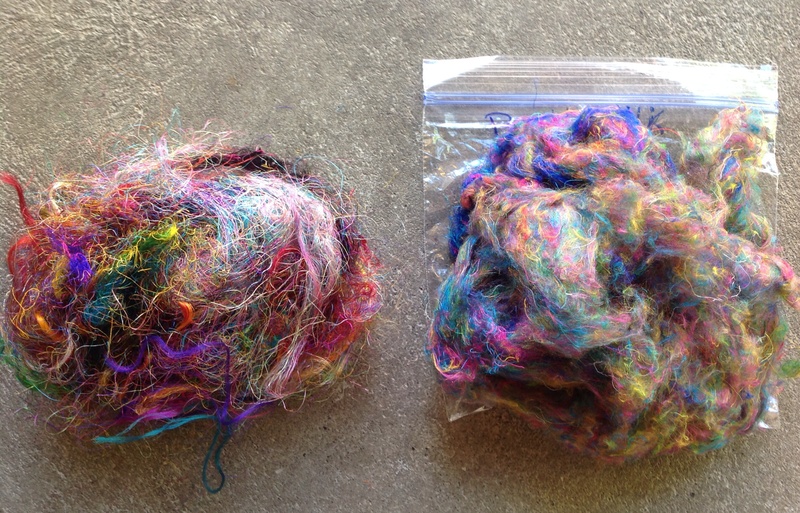 Websites, blogs, shops, Independent dyers, fiber artists, fiber products, both new and old. (I say old as, it could have been around for several years, but if I’m just discovering it, then just maybe, an oldie but goodie, will be new for you as well) This is an amazing time for us… We are gaining power in numbers, and how can new people coming across soft fluff, not want more. Knitting, crocheting, fiber arts etc is already shown to be healthy for people. Clinical studies being done show this. I saw this video and had to share. check out this video… How fortunate we are!! My husband is very big on laundry detergent, liquid softener, and dryer sheets. The scent these products leave means clean. And despite directions, if one dryer sheet works well, then four is going to be fan-freakin-tastic. Meanwhile, I am allergic. It doesn’t happen all the time, but when it does, I get red, itchy hives. While the hives can happen anywhere clothing items with this allergen touch my skin, for some reason, it always happens to the worst areas, my undergarments. So, bras, underwear, you get me? It’s the absolute worst! the first time it happened, I was five years old, was at a friends house and decided to go into the hot tub. It wasn’t heated, so for a child it was like a fun mini pool. I didn’t have a bathing suit, so I borrowed her bikini. The next day, the hives were only on my privates, in the perfect shape of a bikini. My mom, freaked. I can’t imagine what was going through her mind, having such a horrendous rash on her child’s body, in all the wrong areas. Immediately took me to a doctor who very quickly figured out, it might be, chlorine(but it would’ve been all over, not bikini shaped), and he suggested laundry detergent allergy as I told him I wore my friends bikini. Sure enough, they used a different detergent, then my family used. Mystery solved. Here, my husband is doing the sweetest thing, cleaning the clothes, but I end up with this disaster. 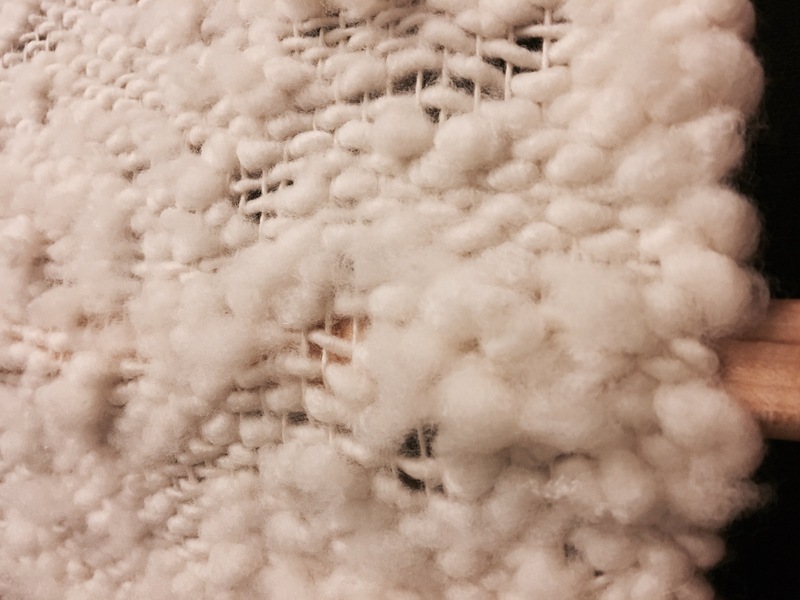 Granted, he (used to) regularly use 3-4 dryer sheets per large dryer load, I started getting the hives, and if he did my laundry following this only used one. Sometimes it still happened. The liquid detergent and the liquid softener aren’t a problem, but the dryer sheets were definitely hive inducing. 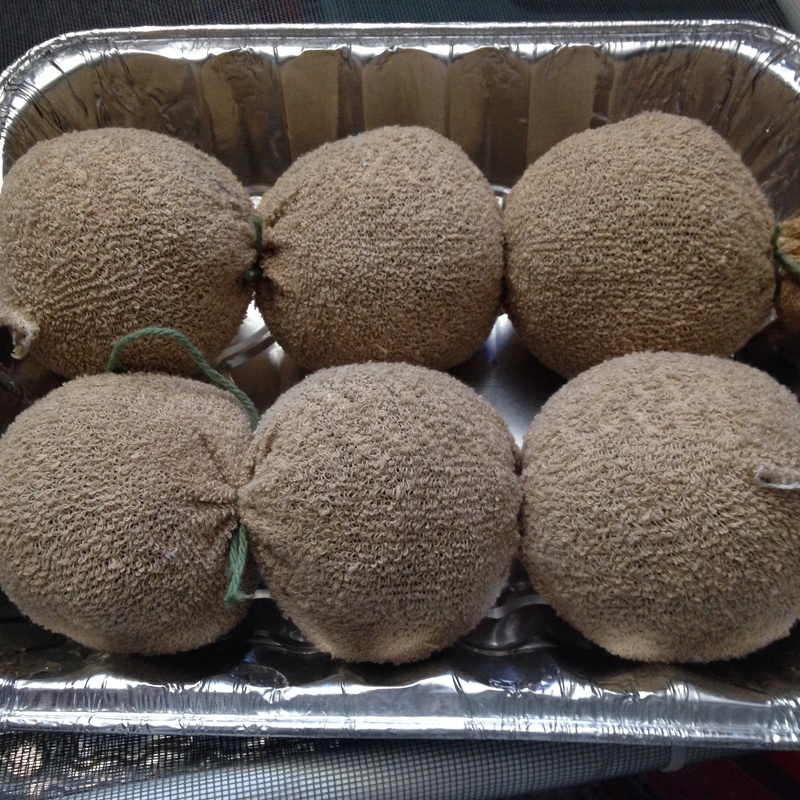 We have been using the new wool dryer balls I made, as seen in my earlier post. I put them inside the old dryer sheet box, pretty fancy, I know. I’m working on finding the cute basket they are supposed to be in. No, but seriously….What a huge difference!!! Clothes are dry, literally in half the time. They come out smelling fresh and the balls are easier to find. We are no longer picking out dryer sheets hidden in pant legs. Have you had that problem with dryer sheets? Playing where’s Waldo, only to find them sticking to clothing like toilet paper to your shoe? Why isn’t everyone using these? They are amazing! I’ve actually read the spiked plastic version of these dryer balls sold in the big pharmacy/grocery stores are also bad for us in their own way. That they are made with oil based products and that with each use tiny molecular bits fall off into laundry. 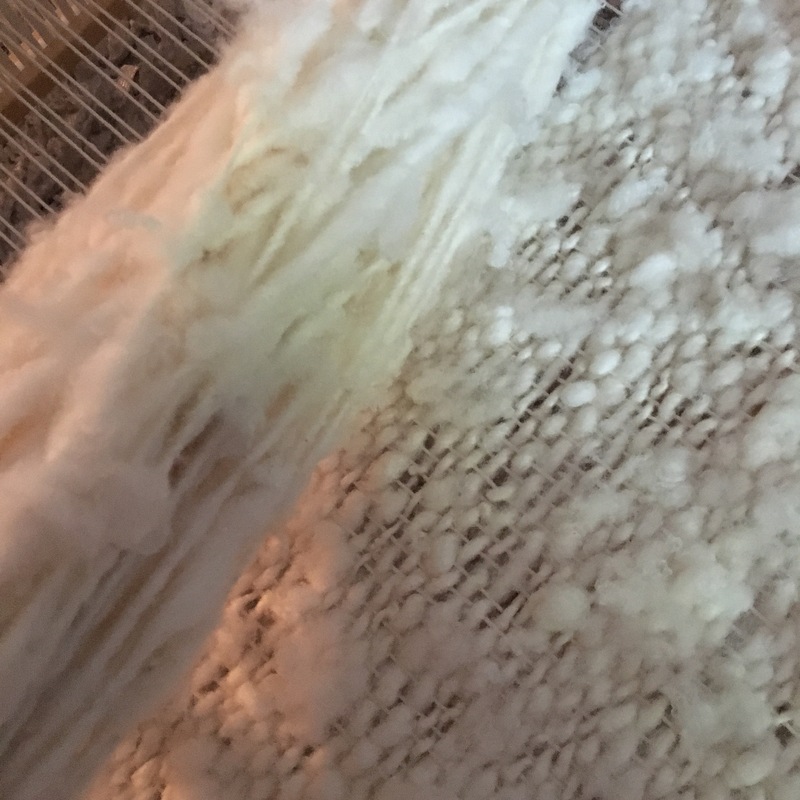 I don’t know the particulars about that, I didn’t read it on wiki, but I do know wool is an awesome, renewable resource that’s safe for our planet and drying our clothes. 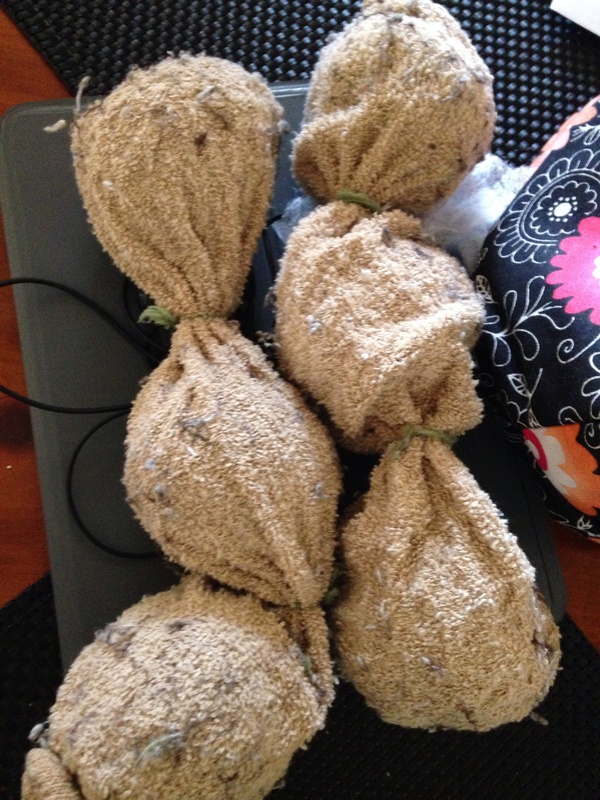 Felted dryer balls last years, and when the time eventually comes should they need to be tossed, they can be safely used as mulch in the garden. They breakdown in the earth quickly and safely. Somehow, I think we all know the plastic/rubber version will not breakdown so quickly. Let’s face it a felted dryer ball is the safest, greenest, most renewable resource, money saving item, to use in the dryer. Hubby, my biggest critic, absolutely loves them. We no longer use dryer sheets at all, and have had nothing but fantastic results with our laundry. My dryer sheet allergen hives are hopefully gone for good! Wool felted dryer balls were my first attempt at felting. I got exactly what I set out to make! Success. while everyone else saw snicker doodle cookies prior to the fork smash, and chocolate truffles, and cinnamon covered donut holes. Either way, they turned out amazing and were so easy. 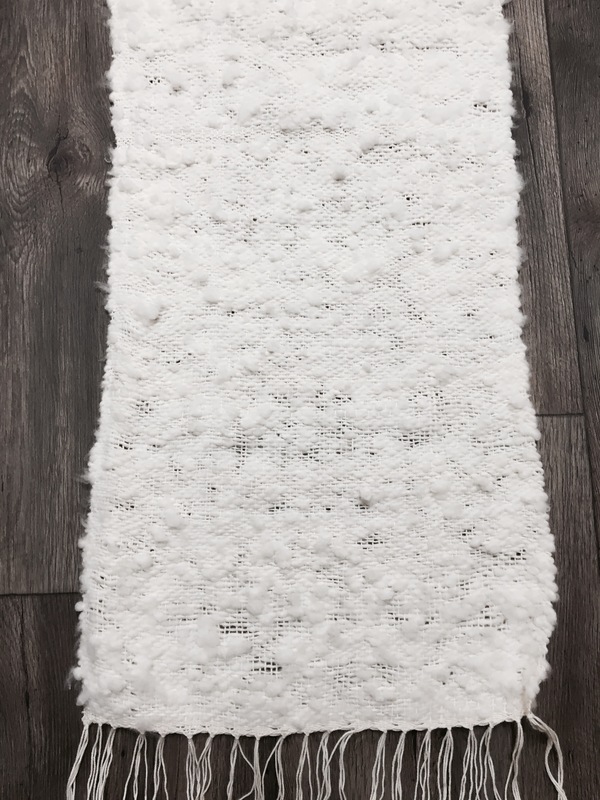 This was an awesome project that will save money in future clothes drying while keeping the chemicals out of the clothing, hence, away from seeping into your skin and dryer sheets out of the landfills. These dryer balls also decrease dry time, saving on electricity. 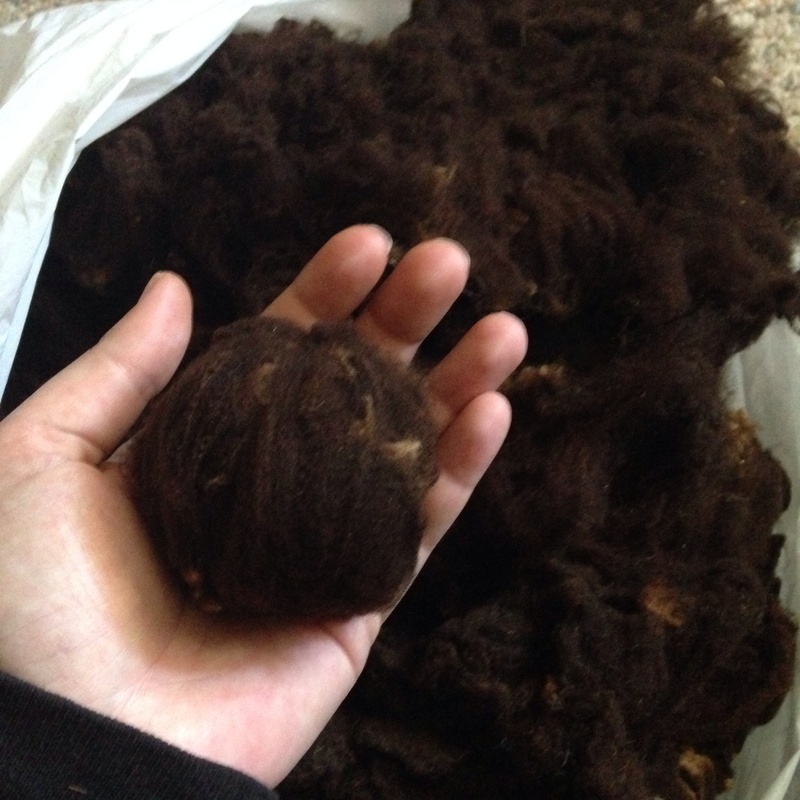 I started out with a raw, horribly tender, old (decades old, no exaggeration) mystery wool fleece. It was very fine, next to skin soft, very crimpy, greasy, fleece. Honestly, I considered throwing it away, or donating it to one of those places that uses wool to clean up oil spills. I hated the idea of not trying to make something useful out of it. 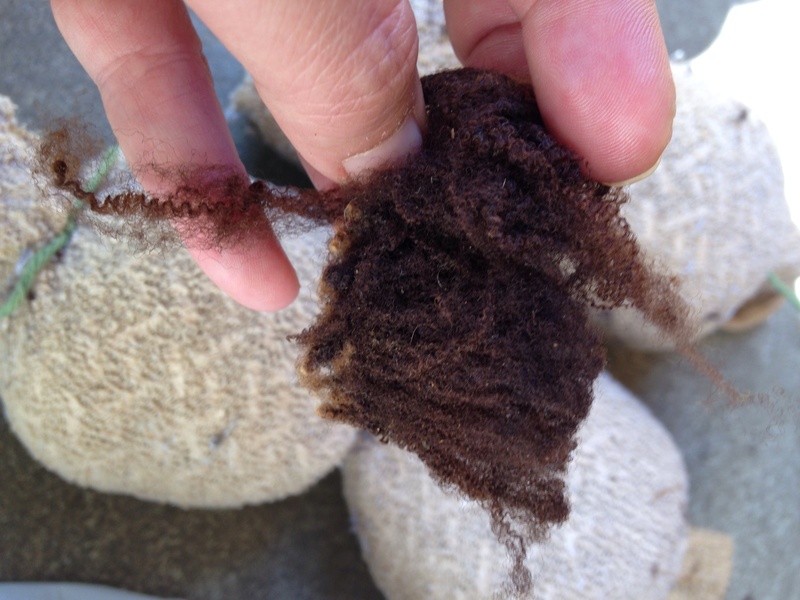 So… I grabbed handfuls of this raw, dirty fleece and stuffed an old, thin from wear, sock. 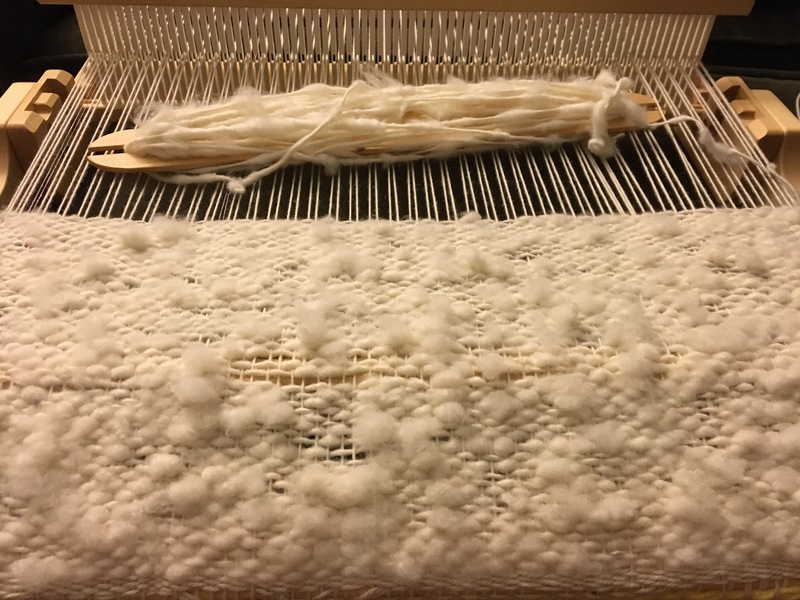 One thing to note, I turned the sock inside out, so the wool would not incorporate and felt to the little loops, that looked like terry cloth, on the inside of the sock. Socks vary, but if one attempts this, I recommend, stuffing the sock with the smoothest portion inside. I stuffed it, to what I thought was pretty solid, shaped it from the outside of the sock, to a round, ball shape. I could actually see the fleece through the sock, again, I used a thin, worn out, old old sock, but I stuffed it good and tight. 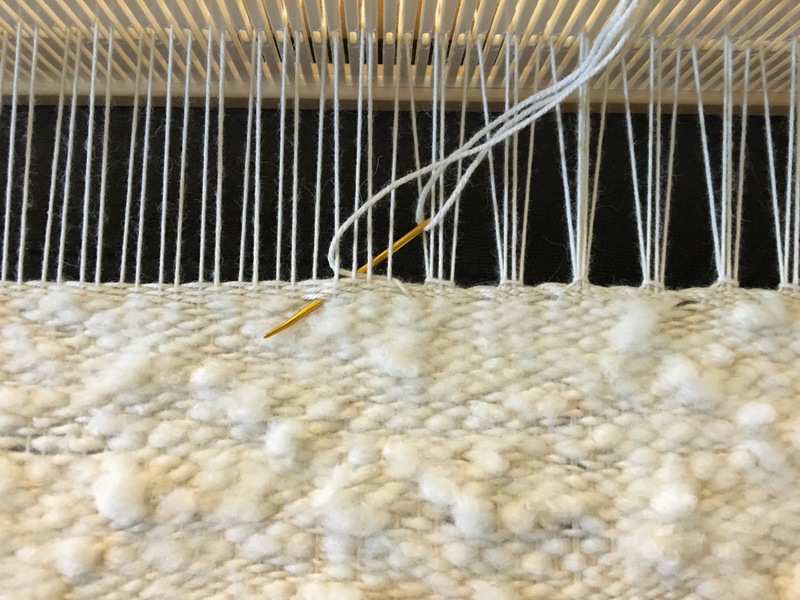 I tied it off with cotton yarn, and stuffed more handfuls of fleece into the sock making a second ball, tied it off with cotton yarn, repeated a third time. I now had 3 balls in one sock, and a good amount of fleece used. I filled up the second sock in the same manner. With high hopes, I threw both fleece filled socks in my top loader washing machine, with 2 white bath towels. When I poured in the detergent, I poured it aiming across all 6 balls in the two socks. I set the wash for a hot wash and cold rinse. I also set it on the comforter, heavy duty cycle with an extra rinse and spin. 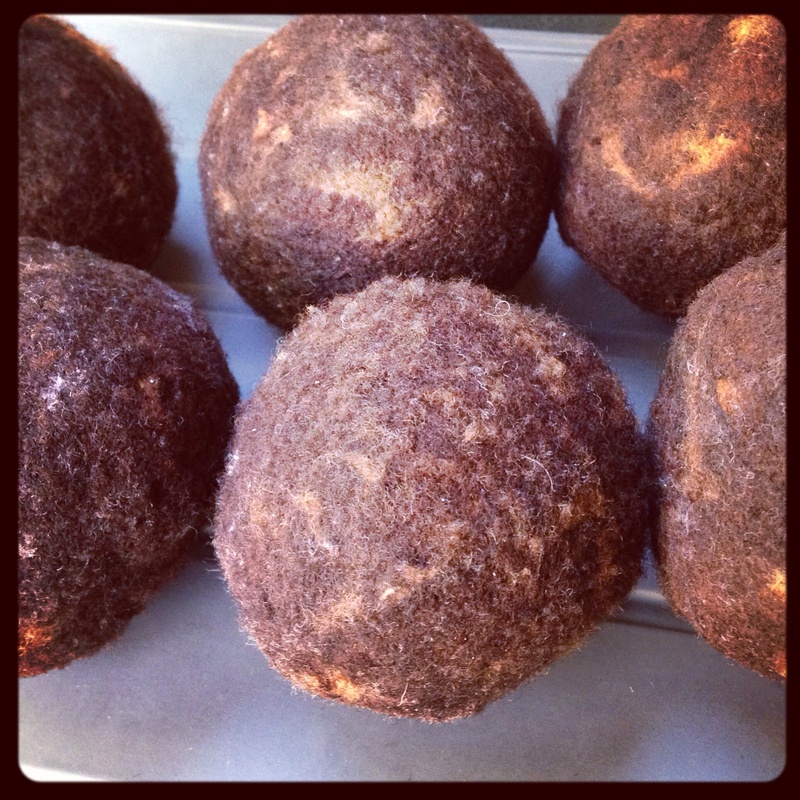 In any case, they felt like hard, round balls inside. 😉 so I threw them in the dryer, with the towels. I was surprised how easy this was, and how perfect they turned out. Since they shrunk so much, my second round, I made two balls per sock, for slightly bigger dryer balls. 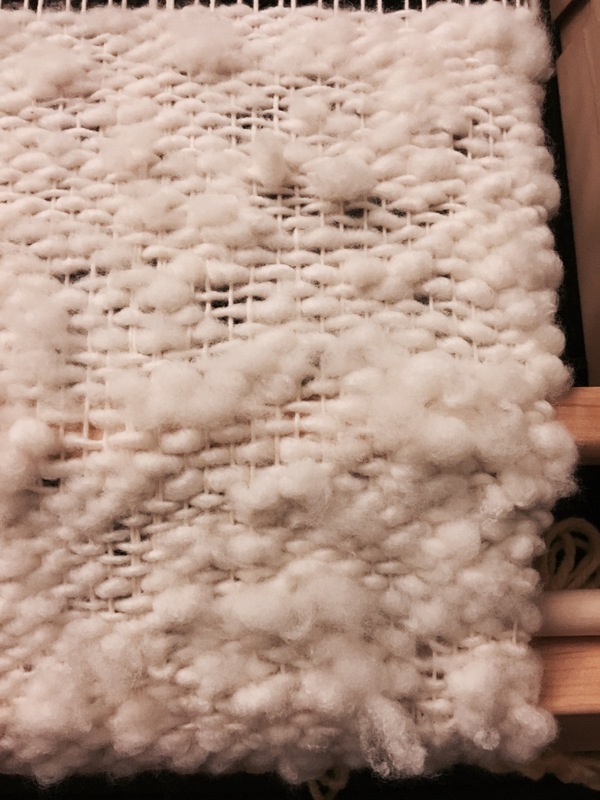 Really, that easy… Stuff, wash, dry, and oh I did trim fuzzes to clean it up a bit. I probably didn’t need to but, I did. Once you start trimming, it’s kind of addicting, for me it was anyways. 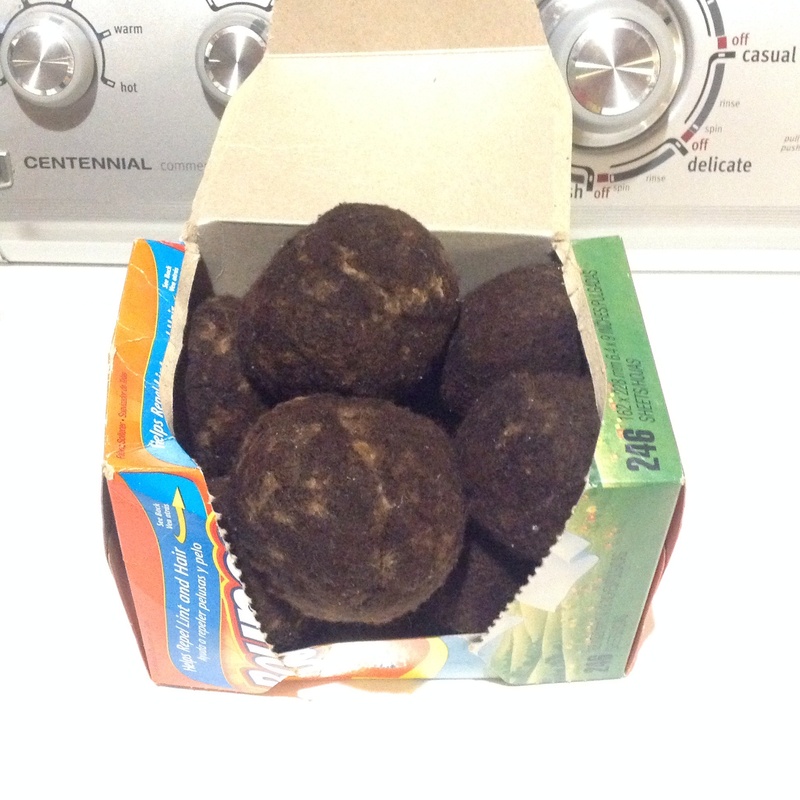 Now, I have a set of 10 dryer balls, and feel I used an old gross fleece very wisely. From trash to money saving treasure. If I were to make some of these as a gift I might felt some swirly pieces of bright yarn or some wool nepps in a coordinating color for a cute polka dot look. 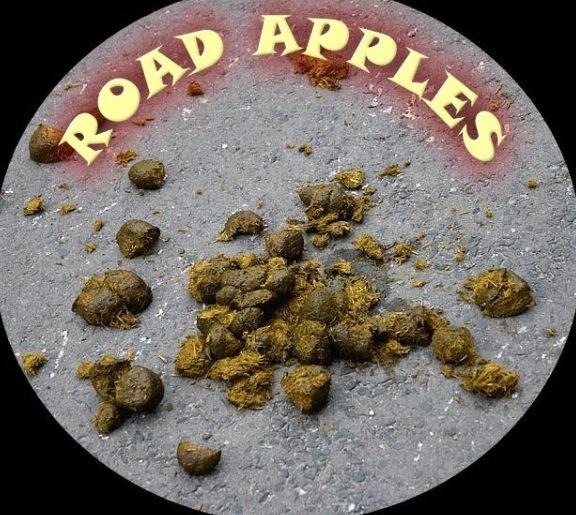 Although, I kinda like the plain old road apple look myself. If you wanted to spruce up the gift, you can add a favorite scented essential oil, and a drop can be placed on the dryer ball prior to throwing in with laundry for the smell good factor dryer sheets have. ill be honest I loooove the smell of my fabric softener. So I’ve made a spray bottle with a watered down version. Way watered down. And I spritz the dryer ball prior to use. Hey I’m still saving money and the environment. 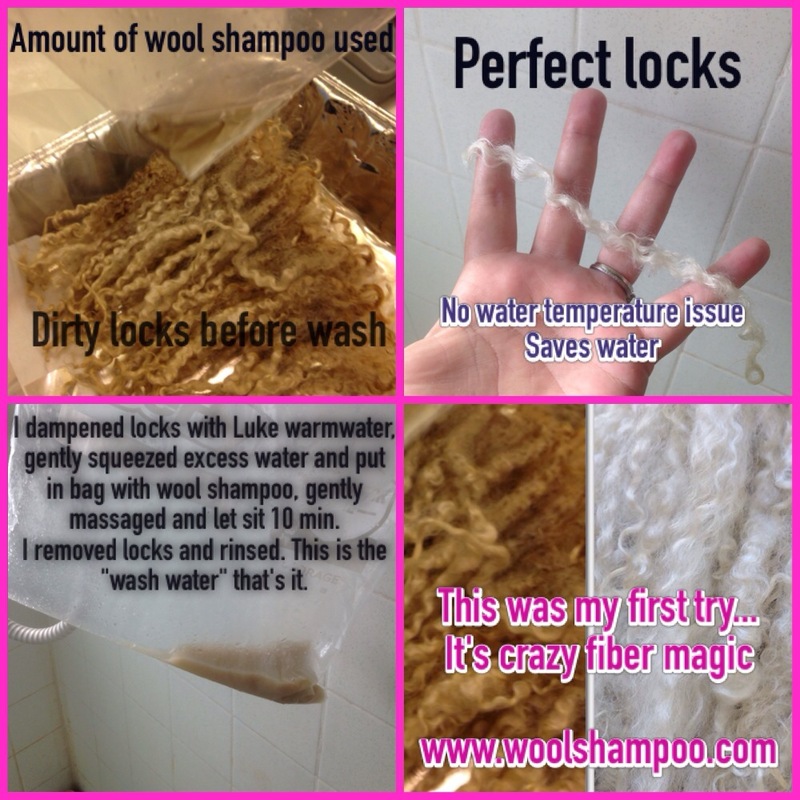 next time you think a raw fleece is unusable give this a try before trashing it.